Brazil’s Chamber of Deputies, the lower house of Parliament, will today vote on yet more corruption charges against President Michel Temer. In early July, the rapporteur for a Brazilian lower house committee examining a corruption charge against Temer recommended that the body vote to put him on trial. Two-thirds of the lower house’s 513 members must approve the charge against Temer for it to move to the Supreme Court. If the top court accepts the charge, he will be ousted from the presidency. If Temer survives the vote, he will likely remain intact until presidential elections in 2018. 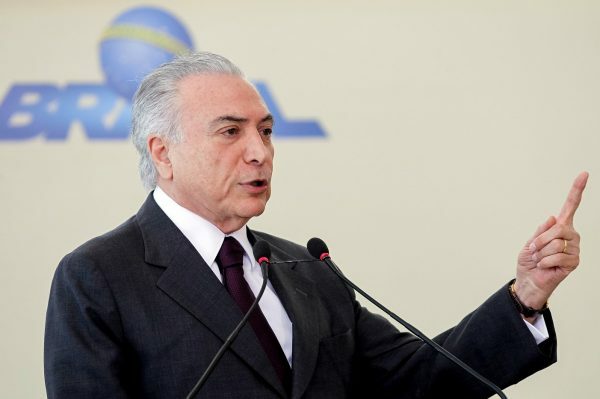 The lower house vote comes after Prosecutor General Rodrigo Janot formally charged Temer with accepting $11.47 million in bribes from officials at Brazil’s biggest meatpacker, JBS SA, to cover up corruption within their company. In late June, Temer took to national television to appeal to the Brazilian public and claim his innocence. In a bitter political irony, Temer now finds himself facing the same type of vote that he forced on his predecessor and former President Dilma Rousseff.